Canon yesterday started the first quarter financial statements with a downer: they cut their full-year estimate of camera sales (compact estimates down 15%). Growth rate for the first quarter year to year in compact cameras was -37%, in interchangeable lens cameras -15%. For the full year, Canon projects interchangeable lens camera sales will be up 12%, compact camera sales down 21%. How they achieve that dramatic change from the first quarter results is unclear. The continued devaluation of the yen might help some, but I suspect it's the "activate the market through vigorous sales and marketing activities" that is the real hope. Canon's stock immediately fell 5.7%. And echoing that, Nikon's stock fell 2.3%. Nikon reports their results on May 9th. 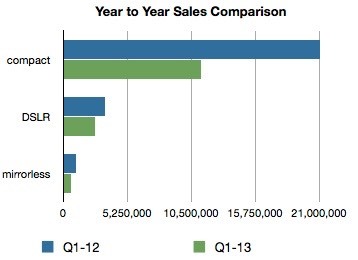 Compact shipments plummeted in the first quarter of 2013 compared to the previous year. This is a disaster for most camera companies. Canon and Nikon share nearly 90% of the DSLR marketplace. That's important, because the dollar value for DSLR shipments in Q1 2013 exceeded the dollar value of all compact camera shipments. While DSLR shipments went down a bit in the quarter, in terms of bottom line dollar hurt on the camera division's financial statements, Canon and Nikon are a bit more insulated from the compact camera collapse than the others. As Canon shows it in their financial results: interchangeable lens cameras are 81% of the "value base" (dollars taken in) for the Imaging group, and that number is anticipated to go up. Still, the squeeze is on. Note that all three camera groups showed declining sales year to year, thus you can't just shift to the growing market and hope that solves your problems, as many of the mirrorless entrants thought they were doing. There are only a few established ways out of a declining market problem: (1) lower prices; (2) market more heavily; (3) build more/better products than competitors; (4) get more efficient (lower costs); or (5) redefine the product category. Nikon is more vulnerable than any of the other Japanese camera companies because it's the only one that derives the majority of its sales from cameras.